I love pastries. I probably love baking them as much as I love eating them. Which is a good thing, because I do eat a lot of them. And who wants to bake something they don’t love to eat? 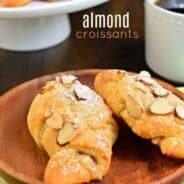 This recipe makes 3 dozen good sized pastries. 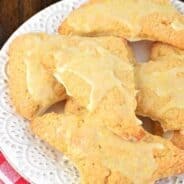 So plan on feeding a crowd when you bake these. I freeze them in ziploc too, then thaw on counter. They are a little softer the second time around, but still quite tasty! 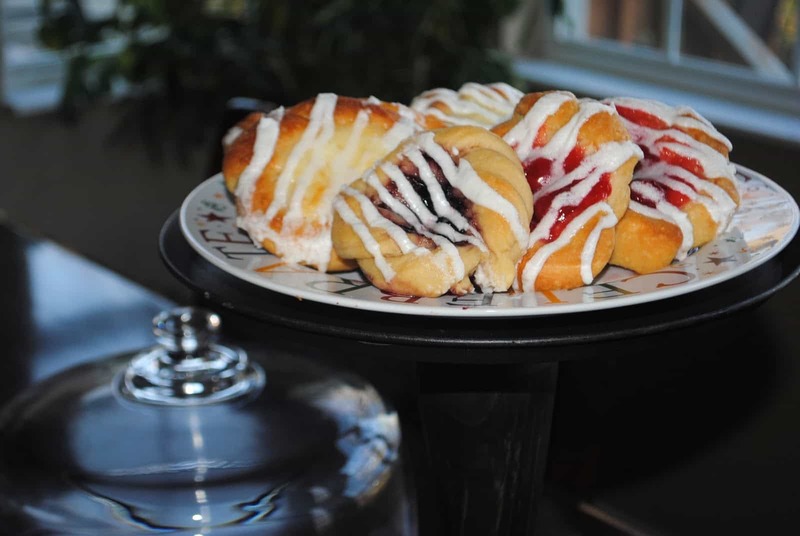 I made some plain cheese danishes, some cheese and cherry, and some raspberry. I think my favorite was the plain cheese. And I’m not a plain person. Ask anyone I know. Wait. Don’t do that. That might be creepy and stalker-ish. Instead, just read my blog, you will see that I like to go OVER THE TOP. Which may be why my daughter Alyssa asks for regular chocolate chip cookies (which of course I have a difficult time doing). Back to breakfast. And danishes. And the fact that these are great to eat before you head to they gym. Or why you should head to the gym. Something like that. *** yes, don’t judge the icing in these pictures. I added a bit too much cream and they separated. Add your cream slowly! In a small bowl, warm milk (110 degrees) and dissolve yeast. Meanwhile, in mixer add flour, sugar and salt. Cut in butter until crumbly, on low speed Add the yeast mixture, half and half cream, and egg yolks. Stir until soft dough (a couple minutes). Cover and refrigerate overnight. ***note***If making same day, allow dough to rise in warm place, covered loosely for one to 2 hours. Punch down dough and divide into fourths. Roll each piece of dough into an 18 inch by 4 inch rectangle. Cut into strips (18 one inch strips). Place two strips side by side and twist together. Shape into a ring and pinch the ends together. Repeat with remaining strips. Sprinkle with coarse sugar. Place on greased baking sheet and cover. Rise for one hour in warm place. Using the end of a spoon, make an indentation in the center of each roll. In mixer, beat cream cheese with sugar until blended. Beat in egg, vanilla and salt. Spoon the cream cheese filling into each “well”. Bake at 350 degrees for about 15-17 minutes. Remove and cool. Prepare icing by beating butter, powdered sugar and heavy cream for 3 minutes until desired consistency. To serve, spoon a small amount of pie filling into each danish and drizzle with icing. Enjoy! These are great – and thanks for including the great how to photos. I love that you included a scratch pastry recipe – too many times I see canned biscuits being called for. I don’t like those things – they never taste as good as the real deal. Hope you have a wonderful week. I can’t wait to try these, love cheese danish! Wow. These look so wonderful and you make it look so easy! Come visit us. We have pumpkin macaroni and cheese today. Happy Thanksgiving. Thanks so much for sharing your fabulous recipe! Oh boy, your pastries look so good and I would love to try to make them. 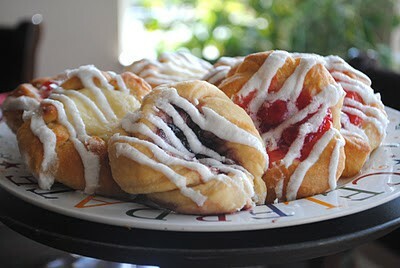 I totally need to do a breakfast party or brunch, I bet these pastries would go over well!! Bookmarking!! I love making homemade yeast dough. 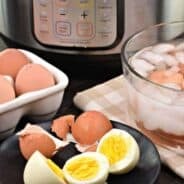 I can’t wait to try this delicious recipe!!! Oh my heck! YUM! I pinned this so I can make these on Christmas Eve. Thank you!!!! You are going to make me fat! I was just saying I want to try and find a danish recipe and you gave it to me. Let you know how it turns out. I just love this Blog and you. Thank you for the share. If you have a recipe for soft and chewy nougat squares like when we were kids I would love it. 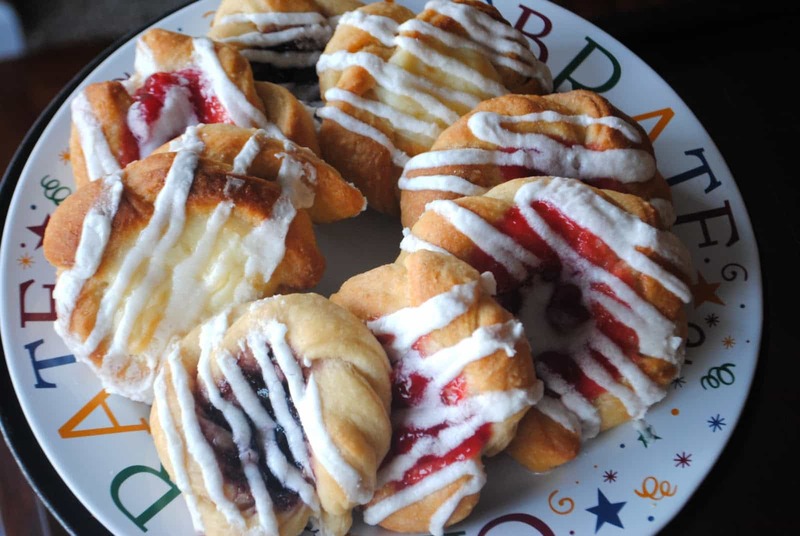 So I had made these a few years ago, and the danishes turned out great! Everyone loved them. I tried making them again this year and they didn’t turn out….they were still doughy after baking, even for extra time. At first I couldn’t figure out why, but I was just reading back through the recipe and realized that when I copied it down the other day, I had missed a step. I didn’t let them rise a second time after making the rings. Could this have been the issue that cause them to not bake correctly?